For many years the Lord ministered to me that He wanted me to write Bible-teaching materials to minister His word to others, and to help them do the same. The vision began as “Living Stones Bible Curriculum” but later God showed me the “Living Stones” lessons were only a small part of a bigger plan. Through many years of ministry to others (mostly children), God taught me many lessons. I also attended Bible classes and small-group Bible studies which helped with God’s plan of preparing me for service. The combination of my lessons, personal experiences while walking with God, and prophecies spoken over me came to fruition in HEART to heart: A Discipleship and Mentoring Plan. This book is a wealth of information to those who desire to share the word of God with others as individuals or in groups. God wants all of His followers to share the Gospel of Jesus Christ with anyone who will listen. He loves all people and wants them to experience His love and abundant grace. God wants each one of us to decide to accept His free gift of forgiveness from sin by asking Him to forgive us and inviting Him to come and live in our hearts and become our Lord and Savior. God wants us to become His children and members of His kingdom and His heavenly household throughout eternity. God wants to be our Heavenly Father but He will not force His love on anyone. God’s nature is love. Have you ever experienced the transforming love and power of God as He poured His grace into your heart? Have you ever experienced the cleansing, healing, and restoration of your heart and life? Have you ever experienced a passion for telling your testimony and sharing the news of God’s transforming power with others? HEART to heart Bible studies can be used for individual and group studies. God has poured out His transforming power and love into the hearts of all believers. Small groups can also offer a demonstration of God’s love in action: believers reach out, and God uses them to demonstrate His transforming power and love to those around them. Through this demonstration of God’s power, His loving-kindness draws others to Himself. Heart to heart: A Discipleship and Mentoring Plan also provides believers an opportunity to study God’s word and learn about Him. It also shows believers how they can, through sharing their gifts, talents, testimonies, and love, help others overcome the challenges in their lives. It also shows them how God can use people, providing them with opportunities to share the gospel and bring encouragement to those with broken hearts and lives. Through the power of God, broken hearts and lives can be reconciled to God, transformed, and restored. Discipleship begins with our family–in our own homes. A Godly nation begins with Godly families! In Deuteronomy 6:6-9, God instructs His people to keep His words in their hearts, to teach them to their children, to bind them as a sign on their hand and as frontlets on their foreheads. He also wanted them to write them on the doorposts of their house and on their gates. God was, and still is, serious about His people learning His word and teaching it to others! 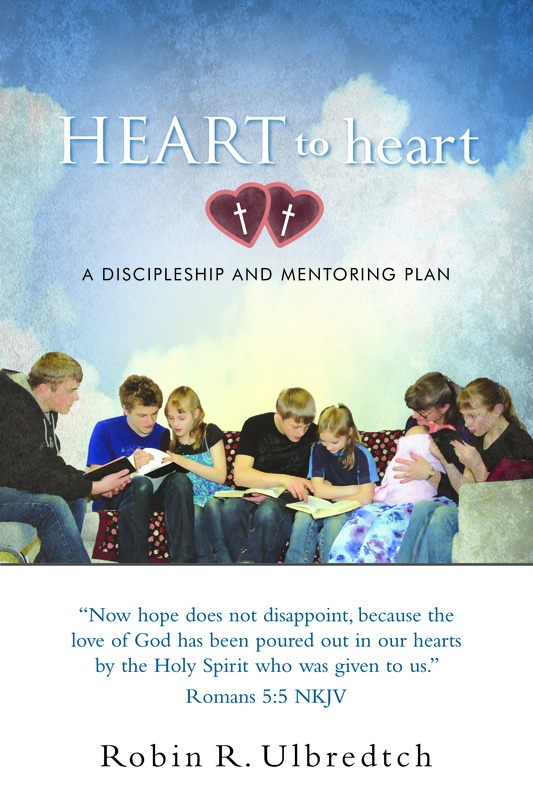 The cover of HEART to heart: A Discipleship and Mentoring Plan depicts this basic foundation of discipleship. A family, whose members are my personal friends and fellow brothers and sisters in Christ, is depicted on the cover of this book. Unfortunately the father could not get free from work at the time this photo was taken. However, the parents have brought their children up in the ways of the Lord, even having their own personal home-school throughout the years. The photo shows each of the family members, with the exception of the baby, reading their Bibles and discussing what they’ve read. The older ones are teaching the younger ones. Once we learn the Biblical foundations and establish a personal walk with God, we can take it out to others around us. Jesus commands us to do this in the great commission in Matthew 28:18-20. Have you ever experienced the transforming love and power of God as He poured His grace into your heart? Have you ever experienced the cleansing, healing, and restoration of your heart and life? Have you ever experienced a passion for telling your story and sharing the news of God’s transforming power with others? HEART to heart: A Discipleship and Mentoring Plan can help those with a heart to share God’s love through these virtual pursuits. Reaching out with God’s love can be done as individuals or in small or large groups. The HEART to heart Plan offers Christian believers a set of guidelines for creating discipleship and mentoring programs in their churches or as outreaches that come under the authority of Jesus Christ and the local church. As the world becomes more evil and more threatening, the HEART to heart Plan can help set up places of support where people can come and get encouragement, love, prayer, and help in dealing with the issues of life. HEART to heart groups can also offer a demonstration of God’s love in action: believers reach out, and God uses them to demonstrate His transforming power and love–that He has poured into their hearts by the Holy Spirit–to share with others. The HEART to heart Plan provides believers with an opportunity to be used by Jesus to help others overcome broken hearts and lives through sharing God’s word, their gifts and testimonies, and, most of all, love. I’m excited to see what God’s going to do with this book and the future Bible Studies coming down the road! May God get the glory for all of it! If you have any questions about this website, HEART to heart: A Discipleship and Mentoring Plan, or any other topics that come up from reading my websites and other writings, please feel free to email me at getrobinu@gmail.com or call my cell phone at (208) 217-5919. All scripture on this site, unless specifically noted, is taken from the New King James Version. * Copyright 1982 by Thomas Nelson, Inc. Used by permission. All rights reserved. *From The NKJV Study Bible, Copyright 1997, 2007 by Thomas Nelson, Inc.